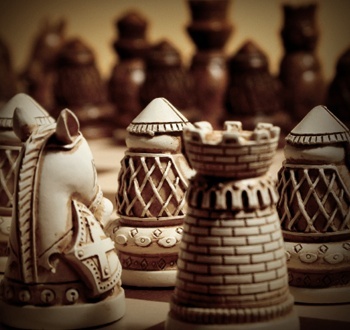 StarCraft and Total War have their origins in games like chess. But where did games like chess take their inspiration from? Since the beginning of recorded history, humans have played games which simulate the dramatic tension inherent in war. Game pieces meticulously carved from wood, bone and stone were found in Egyptian tombs dating as far back as 3500 B.C.E. Several ancient Egyptian games have been discovered, including Senet, Mehen and Hounds and Jackals, but their papyrus rule manuals (if they existed) sadly did not survive. Even so, it's clear in the game of Senet that the pieces represented men or military units and were placed on a finite grid that corresponded to a battleground. It's amazing that over five millennia ago, men were playing games which bear a striking resemblance to what is being played at your local gaming store. Some of these games had ritual or religious significance. Some of them were used as a way to teach military strategy effectively. Some of them, on the other hand, were just plain fun to play. To read more about the ancestors to your dad's old set of Stratego, check out "Wargaming Through the Ages" in Issue 226 of The Escapist.